If I told you I was deciding between the goat cheese and onion galette or a sandwich on fresh bread from a local bakery to fill up my belly, you’d probably think I was at a cute little café about to enjoy some lunch. Would you believe I was, in fact, in the concessions line at my local independent movie theater? While most of us associate oopy goopy popcorn, big-name candy and buckets of soda with the movie watching experience, there is another way. I, for one, am thrilled to sing the praises of those folks who are trying to do it a little better and a little healthier. 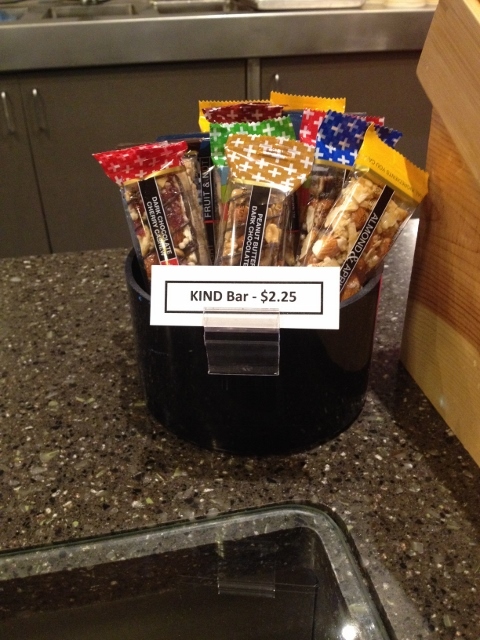 The available snacks at our beloved Pickford Film Center in Bellingham, Washington are a far cry from the offerings you’ll find at traditional theaters. I think we can safely say this finger food is the most beloved of all movie snacks. The smell, the crunch, the salt…and the butter-flavored oil squirted on top. It’s delicious, yes, and popcorn does count as a whole grain, but in this form it’s also a high calorie, high saturated fat, high sodium snack served in ridiculous portions. While I still wouldn’t call it health food, the Pickford is trying: they proudly offer non-GMO popcorn, plain or topped with real melted butter. And then, things really get exciting as you make your way to the Spice Bar. 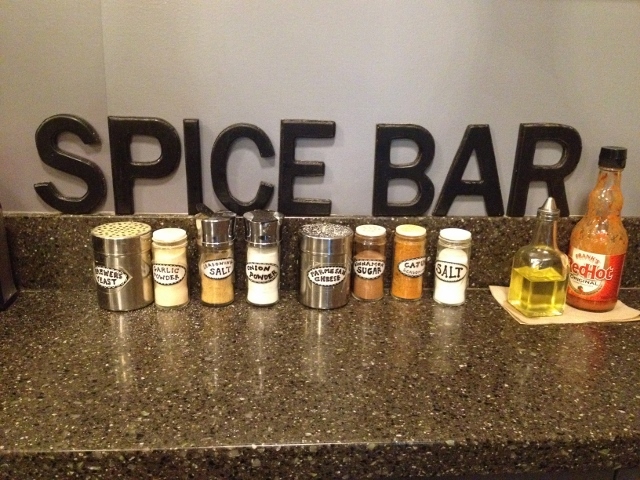 That’s right, I said Spice Bar. Walk yourself and your bag of corns on over and choose from your salty toppings (seasoning salt, Parmesan cheese, Cajun seasoning, or salt) or your non-salty toppings (brewer’s yeast, garlic powder, onion powder, or cinnamon sugar). I must say, I do like choices. I like a Junior Mint now and then. (“Who’s gonna turn down a Junior Mint? It’s chocolate, it’s peppermint– it’s *delicious*!”) And I’ve been known to get Raisinets, rationalizing that there is actually fruit hiding under the chocolate. But none of the candy options at the theater are really smart choices, and calories is one of the reasons why. Here is the calorie scoop, from low to high, for the theater-sized boxes of some classic sweet treats. This assumes, right or wrong, that you’re going to eat the whole box. But there are alternatives. The Pickford sells a handful of these time-honored favorites right alongside some other interesting possibilities. Let’s take Milk Duds. The bright yellow 5 oz. box costs $3.50 at the regular theater and has 595 calories. 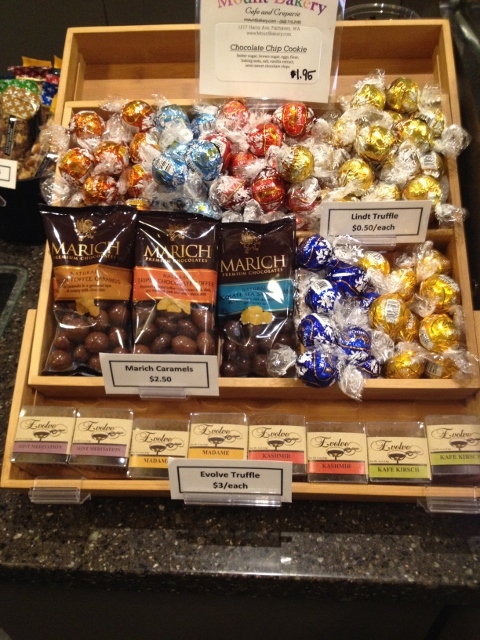 Instead, I tried the Marich Premium Chocolates Natural (Dark) Chocolate Sea Salt Caramels, which look an awful lot like Milk Duds. The good news is that the serving size is 1 (2 oz.) package, with 260 calories, and they were spectacularly good. The caramel was extremely soft, with a pleasant burnt richness and the touch of salt made for a perfect flavor and texture combination, all for $2.50. That may not seem like a better deal ounce for ounce, but it’s definitely better as far as my waistline is concerned. I still got to eat the whole bag but with only half the calories. Other exciting sweets included Lindt Truffles, Evolve Truffles and fresh chocolate chip cookies from a local bakery; cookies so yummy, apparently, that on this day they were already sold out. 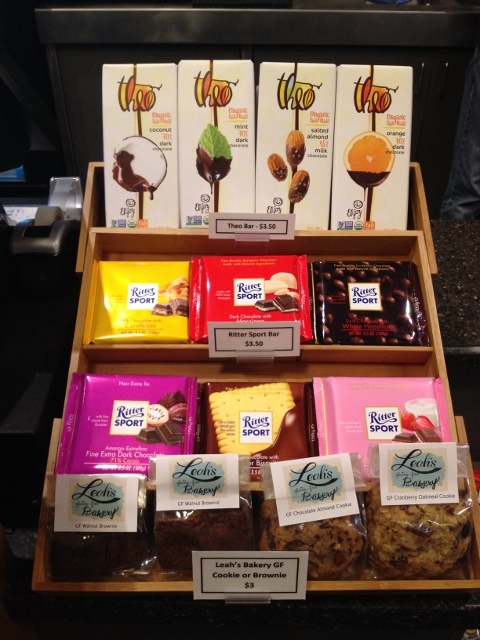 They also had a few options for dark chocolate among their Ritter Sport and (organic and fair trade) Theo chocolate bars, not to mention some gluten-free cookies and brownies. 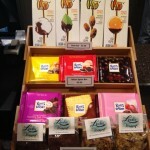 If you didn’t want candy at all, they had a little collection of kid-friendly fruit and nut KIND bars. If you’ve got a salty snack and a pile of sweets, you’re probably going to get a little thirsty before your movie’s over. 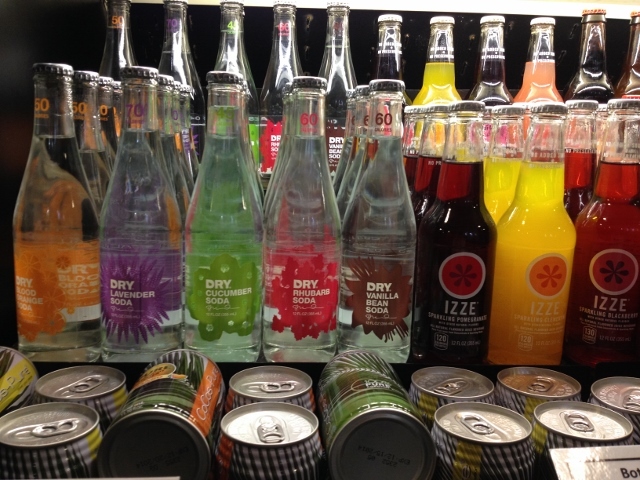 Soda is definitely a crowd pleaser and the Pickford has the usual suspects on tap, but there are some fizzy alternatives with notably better ingredients, too, like Izze Sparkling Juice and the lower calorie Dry Soda. And I bet you wouldn’t find organic coffee, 100% juice smoothies, coconut water, iced tea, or hot tea at your local multiplex. Theaters everywhere are starting to offer other edibles beyond the trifecta of popcorn, candy and soda…probably because they know we see the outing as an excuse to eat. Our local 16-screen movie “stadium” now serves up pizza, hamburgers, mozzarella sticks, french fries, cinnamon-roll bites, nachos, and chocolate-covered ice cream bars. 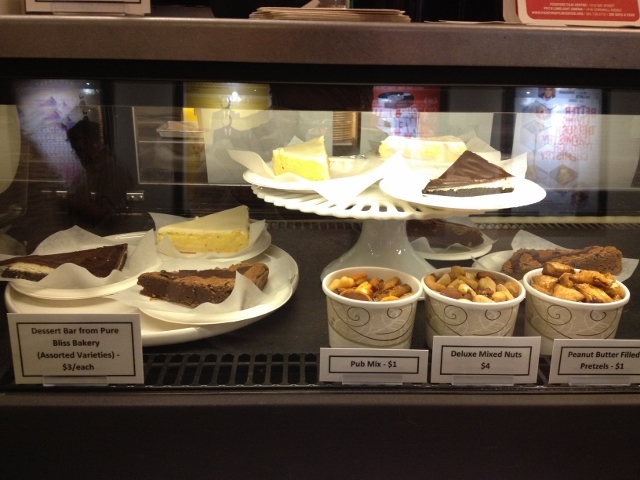 The Pickford has diversified as well, but with cheese plates, salads, peanut butter pretzels, mixed nuts, sandwiches, and fresh-baked brownies and Nanaimo bars. 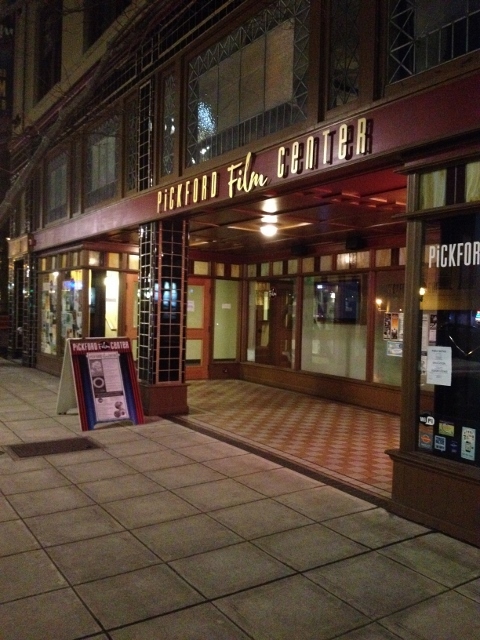 Besides helping the theatergoer, offering non-traditional movie fare can also benefit the community. 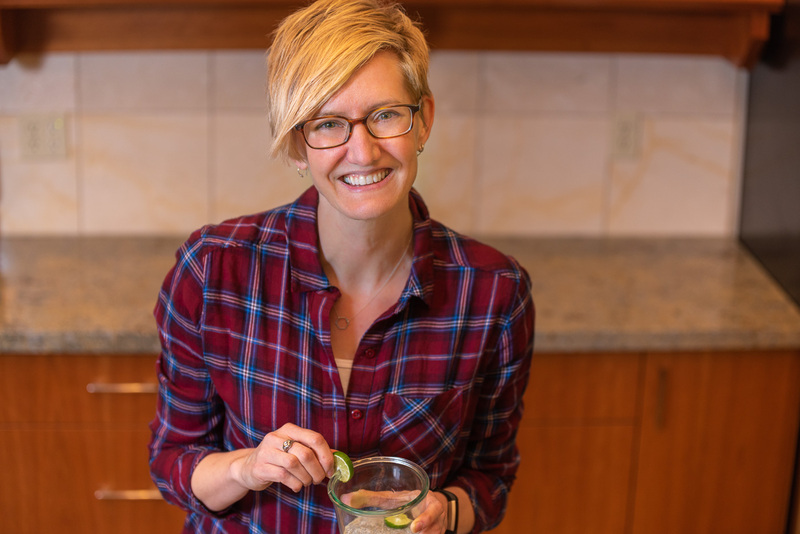 In the case of the fine foods featured at the Pickford, Mount Bakery, Pure Bliss Desserts, Evolve and Leah’s Gluten-Free Bakery are all Bellingham businesses, and Theo is in Seattle. While we prefer the comfort, quiet, and cuisine of the Pickford, we sometimes find ourselves at the mega-theater for a Hollywood blockbuster. For most people, that’s probably the more common movie snack situation to find yourself in. When faced with the neon lights, flashing video screens of food, and glass cases of high calorie goodies, I always start with a bottle of water. Then I go for a better choice, not necessarily a good choice, with a soft pretzel, frozen yogurt, fruit snacks or popcorn without “butter”. While not everyone is lucky enough to have a conscientious independent theater in their town or city making (somewhat) healthy movie snacks a reality, we all have the opportunity to request (somewhat) nutritious options and then vote with our dollars by actually buying them. The fast food restaurants are beginning to move in the right direction…slowly. Let’s see if we can get the movie theater moguls to be next in line. Is your local movie theater getting creative with its cuisine? Or do you (gasp) sneak in your own snacks? Disclaimer: This is not a sponsored post. I’m a regular customer of both theaters in town, but have no relationship with either. I happily pay for my tickets and snackies on my own. Wow, I may have to plan a trip up to B’ham for my next movie! However, I gave up my favorite childhood treats, Junior Mints, ages ago because they were not vegetarian. Has that changed or do they still have gelatin? Hi Gretchen. I double-checked the ingredient list for Junior Mints after I saw your comment and they are indeed gelatin-free. From what I can find online, it looks like they removed it a couple of years ago. Yay! However, the mints do contain confectioner’s glaze which has its own problems. It’s another name for shellac and it’s derived from insects. Raisinets have got it, too. Geez – that’s gross and disappointing. (You can read more about the ingredient here from the Vegetarian Resource Group: http://www.vrg.org/blog/2010/11/30/q-a-on-shellac/) Thanks for your question! Now I know!